Executive Management Associates, Inc. (EMA) is an SBA-designated small, woman-owned professional management services firm whose principal business consists of providing financial management and financial information systems solutions to the federal government. EMA was founded in 1993 by President and CEO, Ms. Nancy J. Slomowitz, as Executive Management Associates, and was incorporated as Executive Management Associates, Inc. (a �C� Corporation) in 1999. EMA was founded to provide a business platform that exhibits ethical management behavior and a high level of quality, and rewards employees for commitment and contribution. Between 1993 and 1999, Ms. Slomowitz provided management consulting services as a subcontractor, specializing in cost analysis and modeling, forensic accounting, and indirect rate analysis. Ms. Slomowitz gained national recognition for expertise in the field of indirect cost rate analysis and forensic accounting, assisting both federal and non-profit organizations with grant applications, negotiations, training, internal controls, and process assessment. In 1999, Ms. Slomowitz incorporated the firm as Executive Management Associates, Inc. and began pursuing the federal market exclusively. EMA�s first U.S. Department of Transportation (DOT) contract was a subcontract with the Federal Aviation Administration (FAA), to provide financial advisory services for an internal �cuff� record tracking system. EMA quickly established its value by recommending steps to move a stalled contract forward. As a result of these recommendations, the FAA replaced a major contractor and achieved its first deliverable. EMA also established intra-FAA agreements for data sharing and developed algorithms for extracting data from legacy systems. In July, 1999, EMA won its first prime contract with the DOT from the Transportation Administrative Service Center (TASC), Information Technology Operations (ITO). TASC was a Working Capital Fund (i.e., internal service unit) fee-for-service organization serving all DOT and some non-DOT organizations. TASC management asked EMA to develop a cost model and evaluate pricing for the Telecommunications Operations (TOPS) division. During the first year of this contract, EMA recovered more than $2M in unbilled revenue; in the second year, EMA recovered another $1.5M. As a result of its exceptional performance, EMA was awarded its first major contract vehicle (Specialized Technical and Technology User Support/STATUS) in August 2001 by the TASC/ITO, to provide general business management services to ITO customers. EMA�s first STATUS award was for financial, procurement, and budget services for ITO programs. Since 2001, EMA has expanded its customer base to include other DOT organizations, the FAA, and the Department of Homeland Security (DHS)/Transportation Security Administration (TSA). The full-time employee base has grown from a single employee to more than 25; revenue has grown from $100,000 to more than $4.5M. Much of this growth has been on the basis of customer referrals. EMA has broadened its range of financial services to include contract closeouts, total cost of ownership analysis, and telecommunications billing analysis. 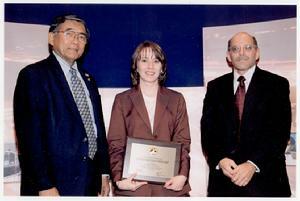 In 2001, EMA was awarded a program oversight contract to the IRS for learning management system support. EMA initiated an innovative procurement partnership with the IRS to acquire its Learning Management System (LMS) and Learning Content Management System (LCMS) through EMA subcontractors.